Mike De Leon's first film in 20 years! I saw it yesterday and it is intense. Jake Herrera is a journalist from a political family who fights for truth in the time of fake news. While Atom Araullo isn't a great actor, he does well for the most part. and the supporting cast is excellent. It also reminds me Miguel syjuco's "Ilustrado" Watch it before it is pulled from the cinemas. Go! A few days before Citizen Jake hit theaters for its commercial release, director Mike de Leon took to Facebook to air his thoughts on star Atom Araullo, implying a rift between the two. The veteran filmmaker talked about how he ended up casting the journalist, who made his acting debut in the film, saying that he initially thought it was interesting to work with a journalist who shared his political convictions. “I only realized later that Atom’s journalism was not exactly the kind of journalism I had in mind,” de Leon said, posting on Citizen Jake’s Facebook page. It's unclear what exactly triggered De Leon's rant on the movie's official page. “It’s not the gritty kind but more of the celebrity-centered schlock that sometimes verges on entertainment, even showbiz. Looking back, I can see why he wanted to become a movie actor. Perhaps the journalist was really a closet movie star,” he said. Mike did not discount the gravity of Atom’s involvement in the film. He said that Atom’s contribution to the film was “substantial,” and that he believes Atom “did a good job” as an actor. “There were scenes where he acted unevenly but there were also scenes, many of them major, where he was terrific. Perfect for the role of Jake, the self-absorbed millennial,” Mike said. Saw it last night. Challenging, provocative and brave, Citizen Jake is a must watch. Although Atom Araullo is understandably the weakest of the actors (though not really so bad...), he is surrounded by a great supporting cast of heavy weights. 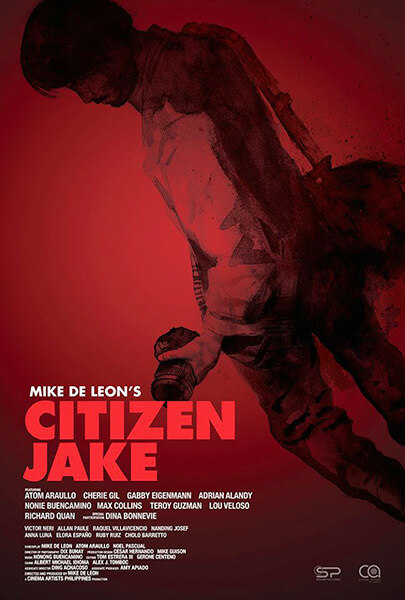 Citizen Jake (Mike de Leon) ***1/2 - Mike de Leon is one of Philippine cinema's major directors. This is his first film in almost eighteen years! So it is pretty much an event. It's about a journalist whose father is a corrupt Marcos loyalist politician who investigates a mysterious death of a young student. It's a politically charged film with heavy elements of neo-noir and mockumentary/meta elements. The film definitely lines up with my personal feelings towards the current political climate in the Philippines and therefore makes me angry (in a good way). Though it's far from a perfect film, there's plenty to admire about it and its heart is in the right place. Mike de Leon still shows that he is one of my country's important filmmakers and people should definitely give this film a shot. I've just gotten out of the theater and I would say it's the most personal of Mike De Leon's work but sadly, his weakest. The plot felt disjointed even with narration already being part of the screenplay. The acting of Mandy and Jake felt forced and Don Jacobo didn't sound like a politician at all. Roxie was too one-dimensional. The others were quite good: Lucas, Enchong, Heidi, and RV were scene stealers. Jonie was above-average but his parents didn't seem authentic. The Justice didn't seem like a man of authority at all and felt like a misplaced sideshow. The dialogue felt unnatural at many points of the film, for instance, who actually says "antics" in the Philippines? And why does most of the dialogue need to be introduced via a ringing cell phone? It was bold of the director to break the third wall and integrate the production itself as part of the exposition but these moments were few and far between. The Nolanesque plot could've been nuanced further and deeper into the setting and characters, but it sadly felt underutilized and underdeveloped. It's staunchly anti-Marcos and anti-Duterte, as am I. I'm also a very big Mike De Leon fan. However, I just couldn't make myself enjoy this film. Hay nako, sina Marcos lang masaya na nag-aaway away sila... Unfair naman sabihin na showbiz journalist si atom, when Mike admits he doesn't watch tv. Agree ako na dapat director ang masusunod, pero yung attacks ni director e personal na. Director Mike de Leon has responded to journalist Atom Araullo’s statement on his experience working with him on Citizen Jake, calling his lead actor a hypocrite and a narcissist. what's your major malfunction numb nuts!!! what's with their squabble recently? puro nasa news feeds lagi yung away nila. what?! are you talkin' to me!!! "De Leon first spoke up about Araullo on May 21, a few days before Citizen Jake was shown commercially." Kung Regal films ito, pakana lang ni Mother Lily. Pero mukhang dapat tanggalan ng wifi si Direk... Masyadong patolero sa fb. On Saturday, director Mike de Leon issued another statement, bidding Atom Araullo goodbye. “May we never cross each other’s path again, not here, nor in the afterlife. But wait, we both don’t’ believe in that. So never,” de Leon ended his short post-script to a week-long social media drama. Bad Behavior has blocked 31201 access attempts in the last 7 days.